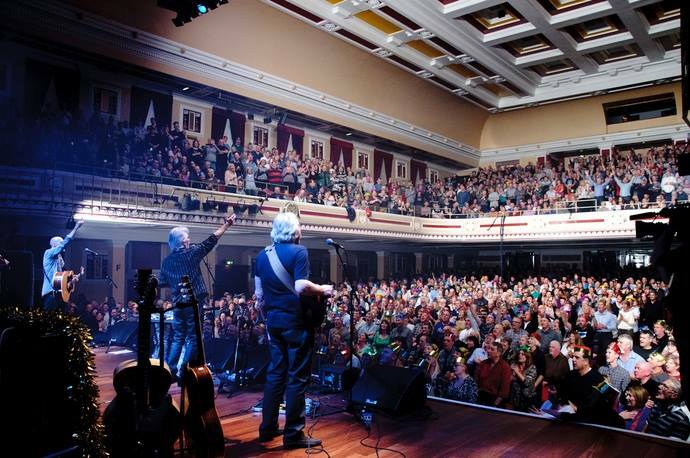 Share the post "Gig review – RAY JACKSON’S LINDISFARNE – Newcastle City Hall, 20 December 2013"
I’m sure everyone is aware of the concept of a ‘bucket’ or ‘wish’ list, a physical or mental note of things you would like to do before shuffling off this mortal coil. I have several things on mine including an epic road trip across Europe and Ferrari ownership, but nestled near the top of my list was an event I thought I had no chance of achieving and that was to attend a Lindisfarne Christmas concert in Newcastle City Hall. As the last version of the band had ceased to be a few years ago I had given up hope of ticking this particular box but, ironically, it was partly the proposed closure of the City Hall and the subsequent campaign to save one of the best venues in the land that led to tonight’s event. The campaign was strongly supported by Ray Jackson and Lindisfarne’s former PR and manager, Barry McKay, and together they hatched a plan to resurrect the classic Christmas shows. Three nights were booked, this show being the first, and all sold out almost overnight. So as soon as I found out about the dates the tickets and hotel were duly booked. Any gig that begins with the doorman asking you to select a party hat in exchange for your ticket is alright by me! Shiny red hat in place and free programmes in hand, the five of us (it was a family affair) headed to our seats serenaded by the sound of Christmas carols being played on the City Hall pipe organ which helped add to the already special atmosphere. 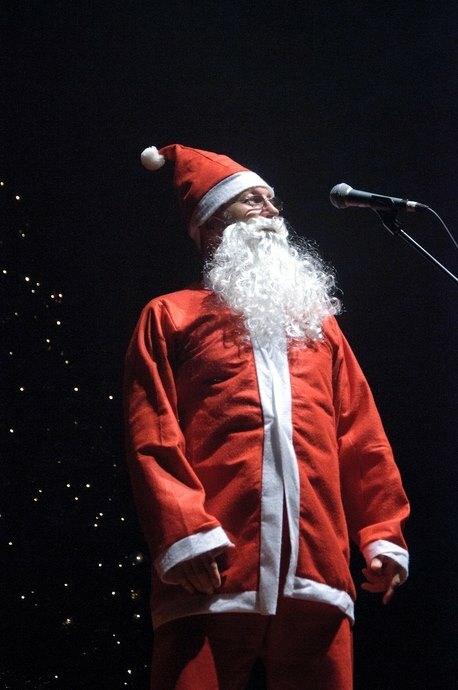 The show began with an appearance from a Geordie Santa to introduce the band before Ray and the guys took to the stage. Prior to the show starting I overheard a conversation in which the gentlemen said he was sceptical over whether this latest line up could rekindle the magic of past shows, but all doubts were banished with the first number, ‘Road To Kingdom Come’. 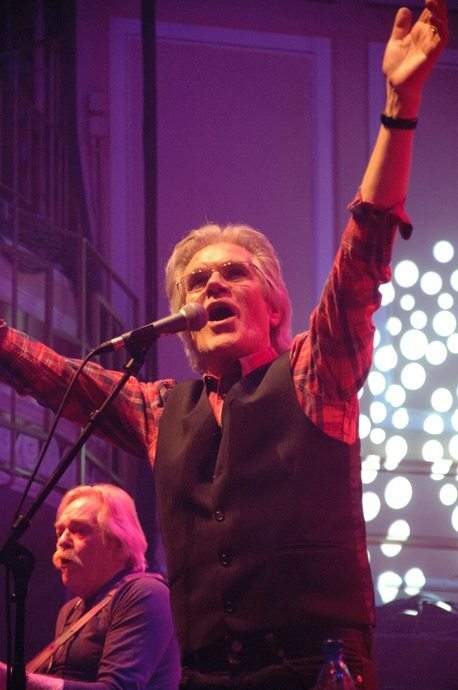 Ray Jackson has always been an integral part of the Lindisfarne sound with his great vocals and outstanding playing, especially on the mouth organ. 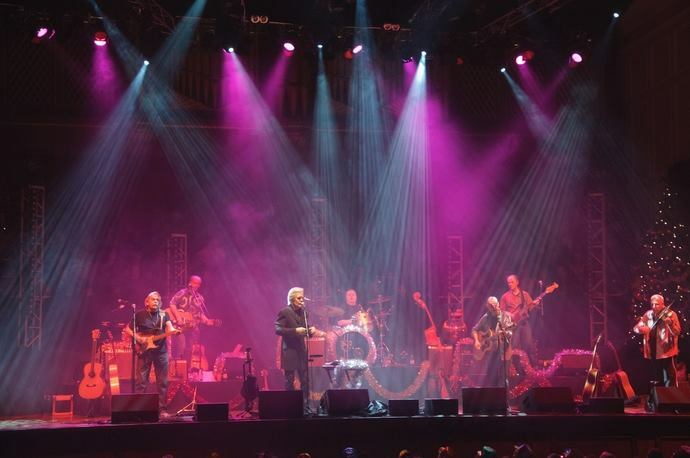 He has also managed to gather a band of fantastic musicians around him, some with a Lindisfarne past pedigree, and it was clear that this was going to be a special show. Ray was the perfect host for the evening, introducing each song with a tale of the song origins or amusing tales of life on the road during the band’s heyday. The first half of the set was littered with Lindisfarne gems, the focus being on the band’s first four albums. Familiar tracks like ‘Wake Up Little Sister’ and ‘Scarecrow Song’ were mixed with less well known album tracks in the shape of ‘City Song’ and ‘Together Forever’. All were lovingly recreated and the band were a joy to behold. The highlight during the first hour was ‘Lady Eleanor’ which was as atmospheric as ever and accompanied with great onstage lighting. The lighting and staging throughout the show were superb as was the sound which was crystal clear, party hats off to the sound engineer! After a short interval Ray and the band returned to deliver another 90 minutes of memories. ‘Caught In The Act’ started off this section and we were treated to a few blues tracks from the Lindisfarne back catalogue which served to show off the band’s talents and the amazing mouth organ work of Mr Jackson. Larry Adler once called Ray ‘the second best harmonica player in the world’ and it is easy to hear why. ‘Uncle Sam’ and ‘Warm Feeling’ followed to raise the tempo and the temperature. The stage was then left to guitarist Dave Hull-Denholm who performed a stunning version of ‘Winter Song’, I’m sure Alan Hull would have approved. The party then got back into full swing as the show neared its conclusion. ‘Fog On The Tyne’and ‘Run For Home’ got the crowd on its feet whilst an extended version of ‘We Can Swing Together’, complete with a selection of Christmas and Newcastle favourites, got the masses singing along at the top of their voices. A stomping version of ‘Meet Me On The Corner’ rounded off the main set with not a hand left unclapped nor a foot unstamped. 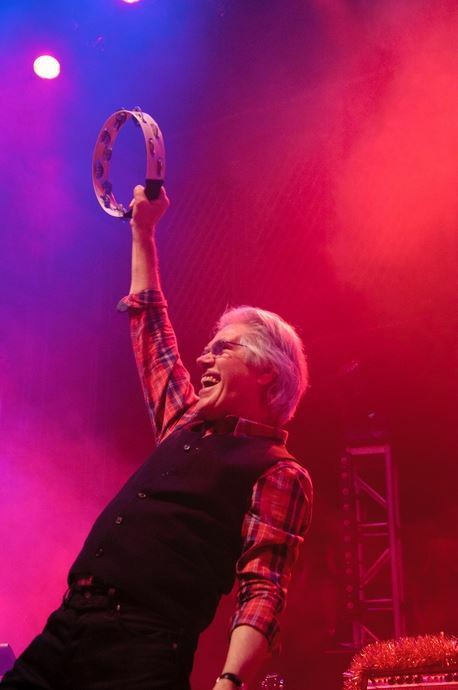 Ray led the band back on stage for a couple of encores, the first being a cover of Roxy Music’s ‘Let’s Stick Together’ as drummer, Paul Thompson, played on the original. The night was finally rounded off with an uplifting version of ‘Clear White Light’ which was a fantastic way to close the show. This show was all I had hoped it would be and I can safely tick this one off my bucket list. It is 37 years since the first Lindisfarne Christmas show and tonight proved that the magic is still most definitely alive and well. Ray also hinted that there could be more Christmas shows in 2014, if this proves to be the case I recommend you get a ticket fast as on this showing the briefs will fly faster than Mr Claus on Christmas Eve, Ho, Ho, Ho! 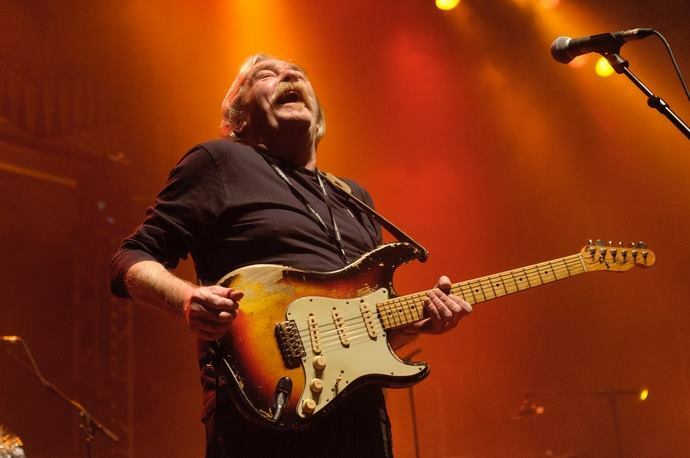 This entry was posted in All Posts, GIG REVIEWS and tagged 20 December 2013, Alan Hull, Barry McKay, Christmas, Dave Hull Denholm, Fog On The Tyne, folk, gig, Lindisfarne, live, Newcastle City Hall, Ray Jackson, Ray Jackson's Lindisfarne, review, Rik Walton, rock. Bookmark the permalink.